The Cape Fear River is a 202-mile (325 km) long  blackwater river in east central North Carolina in the United States. It flows into the Atlantic Ocean near Cape Fear, from which it takes its name. In October 1662, the English explorer William Hilton Jr. made a three-week reconnaissance of the lower reaches of the Cape Fear River. ye [ye=the throughout this quotation] 4th Octob. we weighed, and went into ye Haven, where was 5.6.7.8 fathoms water, and in a weeks time, spent with ye indians, and in sounding ye River and ye ship turning up alway against ye wind, we gott up 15. or 16. leagues into ye river; and after in our long boate, half of us went 15. leagues further, till at ye head of ye river we could not tell, which of ye many rivers to take, and so returned to our ship, and as we went and came, we found many faire and deep rivers, all ye way running into this Charles River. we have seen facing both sides of the river and branches of Cape Fear aforesaid, as good land and as well timbered as any we have seen in any other part of the world, sufficient to accommodate thousands of our English nation, and lying commodiously by the said river's side. 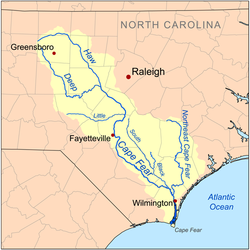 During the colonial era, the river provided a principal transportation route to the interior of North Carolina. Today the river is navigable as far as Fayetteville through a series of locks and dams. The estuary of the river furnishes a segment of the route of the Intracoastal Waterway. The East Coast Greenway runs along the River. ^ Quoted in Gregory E. Rutledge (2013). The Epic Trickster in American Literature. Routledge Studies in Twentieth-Century Literature. Routledge. p. 157. ISBN 9781136194832. Sunset over the Cape Fear River flowing under the S. Thomas Rhodes Bridge. Cape Fear Memorial Bridge in Wilmington is the highest in North Carolina.